On 23 April earlier this year members of the local Niuean community unveiled a unique war memorial in Mt Roskill’s War Memorial Park. This was the Niue Island World War I Roll of Honour: a polished black granite tablet listing the names of men from Niue Island who served in the New Zealand armed forces during the First World War: 150 men who served in the 3rd Māori Contingent and seven who served in other sections of the NZEF. Why did so many men from a tiny and remote Pacific island volunteer to serve in a war which overtly had little to do with them? Well, New Zealand had annexed both the Cook Islands and Niue in 1901. After war broke out in 1914, many local men from both protectorates were eager to enlist, some of them motivated by patriotism, most of them impelled by a sense of adventure, and the colonial administrators on the spot were keen to facilitate their recruitment. 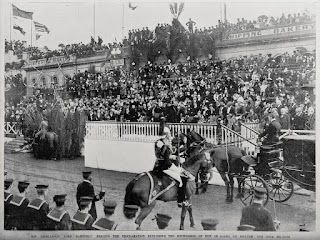 The New Zealand military authorities back home initially welcomed only volunteers of British descent from the islands (planters, sailors, sons of missionaries and the like) and were reluctant to accept ‘native’ troops. However, they soon relaxed their attitude as manpower became scarcer. 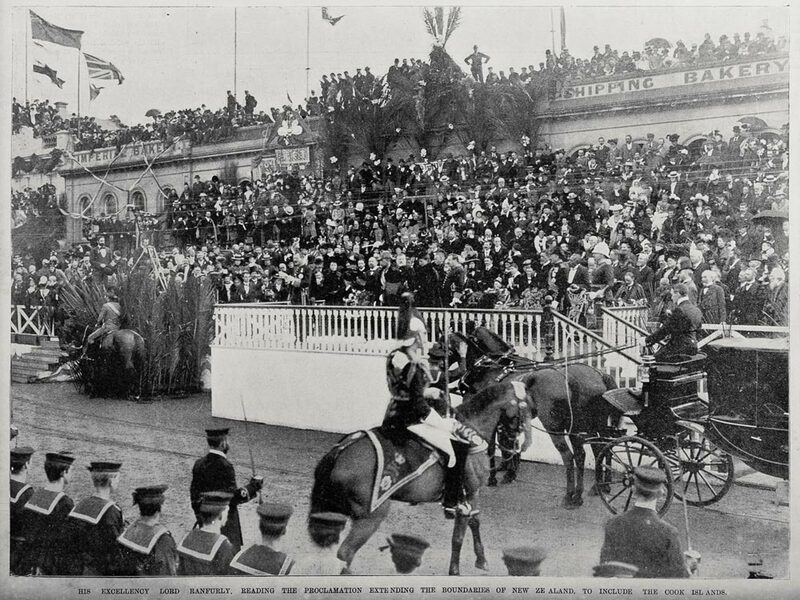 Ref: Auckland Weekly News, His Excellency Lord Ranfurly, reading the proclamation extending the boundaries of New Zealand, to include the Cook Islands, 14 June 1901, Sir George Grey Special Collections, Auckland Libraries, AWNS-19010614-1-2. A contingent of 150 Niue Islanders arrived in New Zealand in October 1915. After training at Narrow Neck, Devonport, 126 of them were despatched to Egypt; in April 1916 about half of their number were forwarded to France to serve with the Pioneer Battalion. These unfortunate men had a hard time of it. Unable to adapt to the weather, more than 80% of them were hospitalised at some time during their period of service. Fifteen men died of disease or exposure and were buried in France, England or at sea (there are also Niuean soldiers’ graves at Waikumete). The entire Niuean contingent was returned to New Zealand before the end of 1916. Ref: Herman Schmidt, Nurse Nobbs soldier group, 5 October 1916, Sir George Grey Special Collections, Auckland Libraries, 31-WP8025. A further 30 men enlisted in Niue in October 1918 but had not left the island by the time the armistice was signed. The stories of Niue’s servicemen are told most fully in Margaret Pointer’s Tagi Tote E Loto Haaku: My Heart Is Crying a Little (2000), Christine Liava’a’s Niue Islanders in World War I (2001), and Howard Weddell’s Soldiers from the Pacific: The Story of Pacific Island Soldiers in the New Zealand Expeditionary Force in World War One (2015). Weddell’s book also covers Cook Islanders, Samoans, Tongans, Fijians and Gilbert & Ellice Islanders (from Kiribati and Tuvalu) who served with the New Zealand forces. In all more than 1000 men from the these islands volunteered to join New Zealand military forces, of whom 107 died of disease or enemy action, 73 were wounded in action and three became prisoners of war. 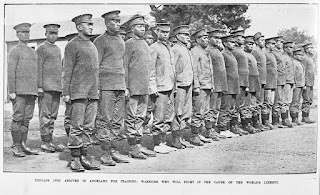 The first contingent of Cook islanders was despatched to New Zealand in October 1915. After training at Narrow Neck , the first of three ‘Raratongan’ contingents to serve overseas arrived in Egypt in March 1916 (the Cook Islanders were generally known as ‘Raratongans’, although their number included men from most other islands of the group, and even two men from tiny Penrhyn Island). Ref: Auckland Weekly News, Tongans [Rarotongans] just arrived in Auckland for training, 28 October 1915, Sir George Grey Special Collections, Auckland Libraries, 7-A14557. The first contingent briefly served in France, but the two later contingents were posted only to Egypt and Palestine. As ‘pioneers’ the men worked as labourers and engineers, and at one time varied their duties by unloading supply boats in the high surf along the Gaza coast. The Cook islanders acclimatised better than the Niueans: eleven of the Cook Islanders serving in the Pioneer Battalion died of disease during the war, although several others were killed or wounded. In terms of numbers, Fiji – then a British colony - probably made the greatest contribution of any Pacific island to the war effort. Most European men of military age living in Fiji enlisted in the Fiji Defence Force. Many of them also volunteered for service overseas, either with the Australian, British or New Zealand armed forces, or with any of the three successive Fiji Contingents. Initially native Fijians were discouraged from enlisting, but in 1917 more than 100 ethnic Fijians signed up for the British Army’s Fijian Labour Corps which went on to serve in both France and Italy. Ref: F W Hennings for the Auckland Weekly News, Fiji assist in the great fight against military tyranny, 29 July 1915, Sir George Grey Special Collections, Auckland Libraries, AWNS-19150729-49-3. In 1918, by arrangement with the British colonial authorities, a contingent of Fijians and Gilbert Islanders also began training with the Cook Islanders at Narrow Neck. The war ended before this group made it overseas. In her book, Qaravi Na’i Tavi: They Did Their Duty: Soldiers from Fiji in the Great War (2009), Christine Liava’a notes that more than 1200 men and women from Fiji enlisted for service, mostly Europeans, but including 108 indigenous Fijians and a total of 42 men of Indian, Rotuman, Gilbert Islander, Samoan, Tongan or Tokelauan descent. Of these, 357 served overseas and 180 died. Although Tonga, as a self-governing kingdom, did not form part of the British Empire, a number of men of European descent born or living in Tonga volunteered to join the Australian or New Zealand forces, and in 1916 the NZ Army sent a recruiting party to Tonga which enlisted a small number of men of mixed Tongan and European ancestry. Christine Liava’a’s Koe Kau To’a Na’anau Poletau: Valiant Volunteers: Soldiers from Tonga in the Great War (2011) lists a total of 91 men born or living in Tonga who served during the war. 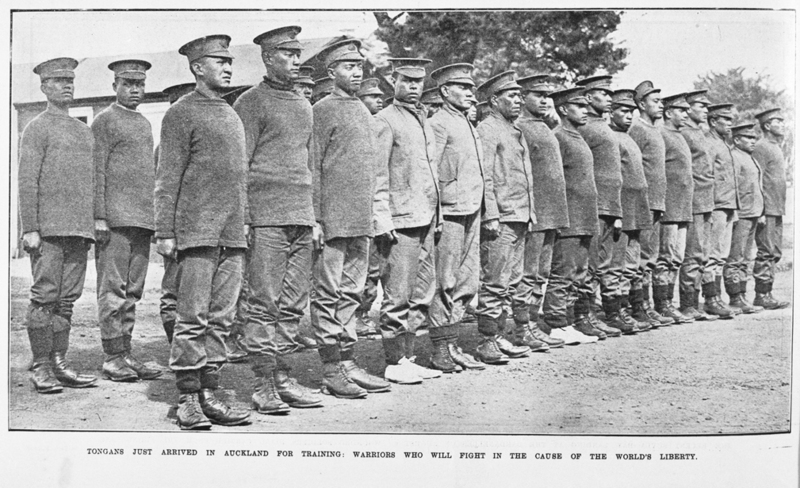 These included 18 men who enlisted in the Pioneer (Māori) Battalion. Ref: W Beattie for the Auckland Weekly News, A full-kit parade of the Māori and Niue island soldiers at Narrow Neck camp, 3 February 1916, Sir George Grey Special Collections, Auckland Libraries, AWNs-19160203-47-1. New Zealand sent its Samoan Advance Force to occupy German Samoa (now Western Samoa) on 29 August 1914. Although native Samoans were technically regarded as “enemy aliens”, a few did make a contribution to the war effort: 14 or 15 ethnic Samoans living in Fiji served as guides or interpreters for the advance force, although without being formally enlisted. At least 25 Samoan residents of European descent volunteered for service with various branches of the Allied forces. 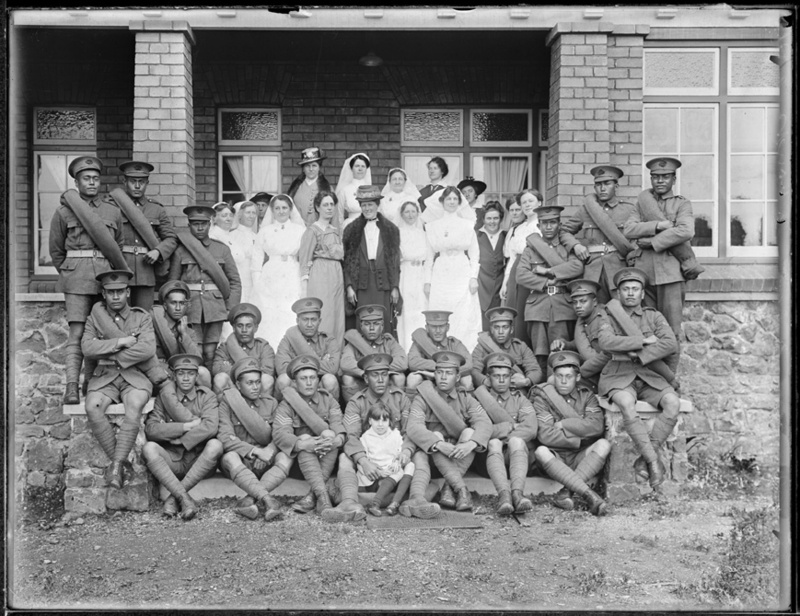 And as many as 50 Samoans of ‘mixed race’ served or trained for service with the Fijian contingents or Pioneer (Māori) Battalion (see Howard Weddell’s Soldiers from the Pacific, and Christine Liava’a, La Fitafita Mai Samoa: The Force from Samoa: Soldiers from the Samoan Islands in the Great War, 2nd ed., 2013). Christine Liava’a’s most recently published book, Taan Buaka Mai Nukan Te Betebeke: Men from the Central Pacific Islands in the Great War (2015), lists men from the Gilbert & Ellice Islands, Nauru, Ocean Island, Marshall Islands, Rakahanga and Fanning Island who served. Among them were a number of Australian- or British-born employees of the Pacific Phosphate Company on Ocean Island and of the Pacific Cable Board on Fanning Island. There were also 25 native Gilbert Islanders, mostly policemen, who enlisted for service and trained at Narrow Neck, although without making it further overseas; and three other ethnic or mixed race Gilbert Islanders who saw active service elsewhere. Ref: Auckland Weekly News, Sturdy Niue Island recruits who arrived last week in Auckland, 28 October 1915, Sir George Grey Special Collections, Auckland Libraries, 7-A14556. The contributions and sacrifices of most of the Pacific islanders who served are well memorialised in their homelands. A Niue First World War memorial was erected at Alofi soon after the war’s end (see also Commemorating Niue’s World War One Heroes, 2015); there are also more recently established memorials at Avatele, Hakupu, Hikutavake, Lakepa, Liku, Mutulau, Tamakautoga and Tuapa. In the Cook Islands there are memorials at Avarua, Mangaia, and Atiu. The Cook Islands roll of honour, originally placed in the Avarua courthouse, is now found in the Cook Islands RSA. Rolls of honour were also prepared for most of the individual islands. Both a local war memorial and a Fijian Labour Corps memorial were erected in Levuka, Fiji, along with a roll of honour at Levuka Public School. In Suva, the Colonial Hospital was renamed the Colonial War Memorial Hospital, a memorial clock tower was erected at Central Buildings, and a Book of Remembrance was placed in Holy Trinity Anglican Church. A memorial cenotaph was also erected in Nuku’alofa, Tonga, and a memorial clock tower in Apia, Western Samoa. The previous version of this blog post can be found in the Internet Archive and the National Library.